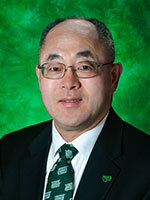 Hanchen Huang is the Dean of the College of Engineering and the Lupe Murchison Foundation Chair Professor at the University of North Texas. He has been the Donald W. Smith Professor and the Department Chair of Mechanical and Industrial Engineering at Northeastern University, Connecticut Clean Energy Fund Endowed Professor at University of Connecticut, and Professor of Mechanical and Nuclear Engineering at Rensselaer Polytechnic Institute where he first earned tenure in 2005 and rose to the rank of Professor in 2006. In addition he has been Royal Society of London KTP Visiting Professor, and Hsue Shen Tsien Engineering Science Visiting Professor. Hanchen Huang has received multiple awards for research excellence, as well as for outstanding advising at home universities. In professional societies, he is an elected Member of the Connecticut Academy of Science and Engineering (CASE), elected Fellow of the American Association for the Advancement of Science (AAAS), elected Fellow of the Society of Engineering Science (SES), elected Fellow of the American Society of Mechanical Engineers (ASME), elected Senior Member of the Chinese Mechanical Engineering Society (CMES), and elected Full Member of Sigma Xi the Scientific Research Honor Society. He has delivered more than 130 plenary/keynote/invited lectures and seminars, and mentored more than 40 post-docs and PhD students.